November 2014 – Amit Bahree's (useless?) insight! Perhaps I am pushing the boundary here, perhaps not but I am having lots of issues with Visual Studio 2014 CTP 4 (specifically Version 14.0.22129.01.DP) and Windows 10 Preview Build 9860. 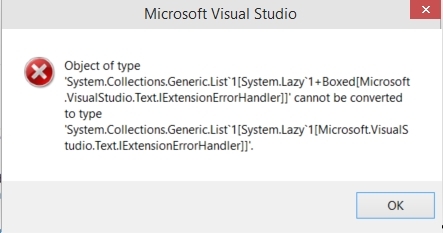 I am not sure I should try a repair, or deprecate to Visual Studio 2013.